Welcome to our monthly podcast which features music and interviews from Blue Ox artists, as well as multifaceted information about the festival. Get a behind the scenes look at how the festival gets put together, as well as new features and information for the 2019 Blue Ox Music Festival. The podcast is hosted by Nate Sipe and Justin Bruhn of Pert Near Sandstone. 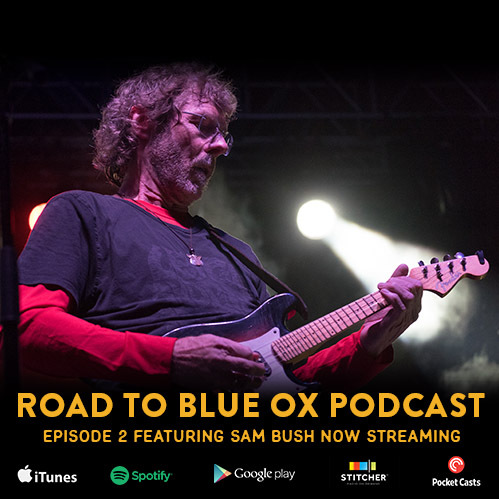 In this episode we talk to the inimitable Sam Bush. He discusses his upcoming single and music video release, as well as the recent documentary on his life, contribution, and influence called “Revival”. Sam also recalls stories from a career which spans the development of music festivals as we know them today. Thanks to “The Paul Bunyan of Blue Ox” for taking the time to chat with us! We are also joined by Cara Martner, the hospitality manager for Blue Ox. She gives us a glimpse of what it’s like behind the scenes during the festival weekend and shares her great perspective on this music community. Nate and Justin share memories about repeating Blue Ox Festival artists Del McCourry and Jeff Austin. We spin some music from them and also The Lowest Pair, who are joining us this year again. Thanks for listening! Featured music on this episode: Keweenaw Flower – The Lowest Pair. Run Down – Jeff Austin Band. All Aboard – Del McCourry Band. Apple Blossom and Circles Around Me – Sam Bush. Stay All Night, Appalachian Girl and Crossroads – Pert Near Sandstone. We are interested to know what you would like to hear on future episodes and any helpful feedback. Send a message to: RoadToBlueOx@gmail.com. Written by: Nate Sipe & Justin Bruhn. Produced by: Nate Sipe, Justin Bruhn, and Pert Near Sandstone. Recorded and edited by: Nate Sipe. For More information: www.pertnearsandstone.com, www.blueoxmusicfestival.com. **Permission was obtained for all music used in this episode.